So, I am finally back to work on my novel- again- and in the time I’ve spent not working on it I have been doing a lot of reading in hopes that some of those mad author skills would rub off on me somehow- maybe through osmosis? Well, this time it seems to have worked. Because I really like what I’m writing. I’m finally feeling like I’m writing the way I want to be writing and the way I am capable of writing. And that’s a really, really good feeling. So, one major thing I realized was missing from my work was imagery- in my first draft, I was very focused on just getting the storyline out, which I did (well, mostly) but my characters still felt very 2-D, and I just wasn’t getting a sense of setting as much as I would have liked. I felt like I was describing stuff, but mostly just because I felt like the reader needed to know what it looked like, but it wasn’t furthering my story and drawing me in the way I felt it needed to. (Don’t worry, I described the house “slumping" later on.) That was closer, but still felt detached. I wasn’t getting a sense of my character’s voice. "Dust particles shimmered in the late afternoon light, tossed airborne by our car's unceremonious arrival, and the long weeds in front of the house swayed like waves in a murky yellow-green ocean. The dust particles aren't settling anymore, nor are they kicked up- now they are “tossed airborne”, which conveys a much more unsettled, off-balance atmosphere. The car’s arrival is now “unceremonious.” Likewise, the grass is now being described as “weeds" (even though it might be grass- who knows, this MC is in a Mood with a capital M right now) and the “ocean” I describe is now “murky". I ditched the word “undulated” because I realized that there are very few normal 16-year-olds who might use that word when “waving” or “swaying” would work just as well (and I decided that “waving” sounded far too cheerful and instead went with the more sickly-sounding “swaying”). I also added a couple of extra adjectives to describe her horse, because I want the reader to understand what he means to her. His absence is a very big part of this scene and her mood: her mother has sold her horse, and he’s basically been her best friend- well, her only friend- for the past 7 years. To give another example (not in the quotations above), I traded out the phrase “buzzing insects” for “incessant drone of flying insects.” Basically, I want to show that right now this character is wound pretty tight, and everything about this new life of hers is grating on her last nerve. The “confetti” reference not only paints a very clear mental picture, but also gives us a clear indication of how the MC feels about that scenario- Cruddy house I’m being forced to move into getting smashed to smithereens? Sounds like a party to me! For the first time the other night I read through my first few chapters and felt like I really knew my MC- I got a sense for who she was, how she was feeling, and what she was all about. Yay! Welcome to the 3-D world, friend! So I’m very excited about where this breakthrough might take me, though judging by what I’ve written above it means my novel will take approximately eighty-two years to finish. *sigh* Oh, well. I’m already making big plans for how the landscape of this new town will play into the theme of the novel and will subconsciously motivate my MC's actions. Woohoo! - Are your adjectives, similes, and metaphors reflective of your character’s mood and personality? - Are your descriptions simply utilitarian or do they help to further the tone of the scene you’re portraying? 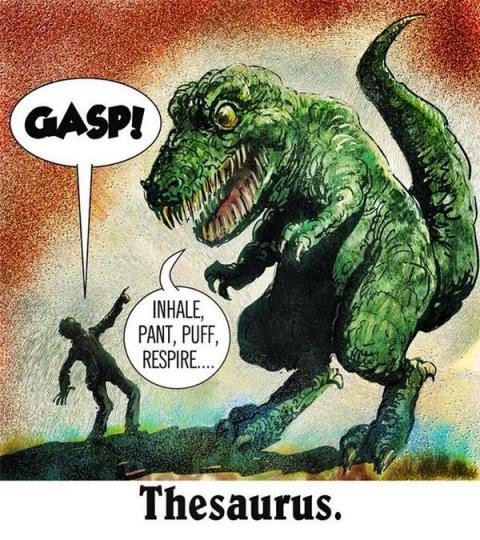 Remember, your thesaurus is your friend! I have to say, I like your first sample paragraph the best. When it comes to description, as a reader, I prefer succinct ones. (John Grisham is good at this.) I applaud your getting back to it!! You go, girl! The Hubby Does a Guest Post!